Unlike Sally and Tim, whose epic journey to Iceland was awe-inspiring, when I decided to do a cycle tour whilst Tom was in New Zealand for a month I took the easy option. 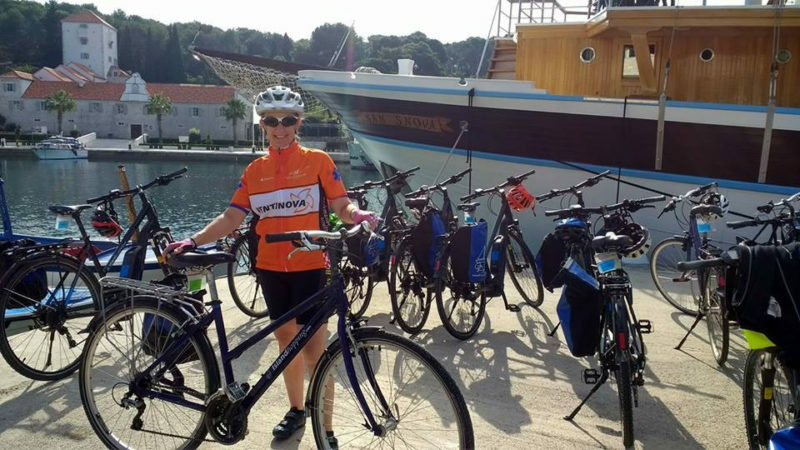 This was a boat and bike tour in South Dalmatia, Croatia, where all I needed to do was pay the money, pack my bag and turn up. I have to admit, this was a nice change from the usual Tom and Julia cycle camping tour, where we had to plan every detail ourselves, get our bicycles to the chosen destination, and sleep on a one inch thick mat every night in a tent the size of our dining table (or possibly less). My expectations were only moderate, but the experience exceeded all my hopes. 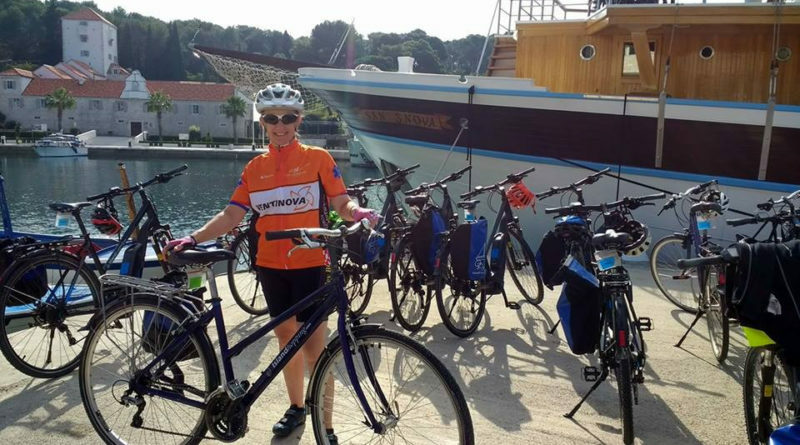 This was a well organised tour, with friendly and very funny Croatian guides, lovely companions, great food, and fun cycling. The icing on the cake was the fabulous weather: although the internet told me that Croatia had an average temperature of 18°C in October, the reality was seven days of 25-26°C with never a cloud to be seen. I never unpacked my lycra tights, long-sleeved cycle jersey or raincoat, and best of all, we had fun swimming off the boat in the not-too-cold ocean every day. The boat was the San Snova, a 31 x 8 m oak motor yacht built in 2009 and in perfect condition – clearly looked after very well. It was very pleasant: all the cabins had comfortable beds, ensuite bathrooms and air conditioning. There were plenty of places for socialising on board, including tables and chairs on two different decks, a sunbathing deck and a saloon where we ate our meals. It was very convenient to be able to hop on a cheap Easyjet flight to Split airport and not have to take a bike! Day One: At 3pm I met the other travellers on the boat, who proved to be a very friendly, fun bunch. They came from Canada, Germany and Switzerland – plus one other from London. The age range was late twenties to early sixties! 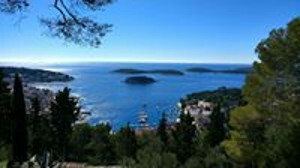 We enjoyed a cruise to the island of Hvar whilst having a “pep” talk from the guides. In the town of Stari Grad, we had a wander around the harbour before hopping back on the boat for the first of many wonderful three course meals. Day Two: On this day we a 15 mile cycle ride on the island of Hvar. There was a 10km mountain to climb and a pleasant ride around the top of this island founded by the ancient Greeks, before a thrilling descent with stunning views took us into the pretty town of Hvar. Day Three: Having travelled to Vis Island during dinner the previous evening, we set off in good time this morning for an undulating ride through the mediterranean landscape of the island’s interior. This revealed olive groves, vineyards and dry stone walls everywhere, dividing the steep terrain into small sections. After this we enjoyed a “swim stop” on the way to Korcula Island. Day Four: We set off at 9am for the longest cycle ride of the trip (30 miles). This proved to be the hardest day of riding, with three long climbs, steeper than the previous day. However, as we pedalled up the roads snaking around the side of the mountains in serpentine fashion, we had wondrous views across the interior of the island and also out to sea. We enjoyed a picnic lunch in a refreshingly cool covered market hall. When we arrived at the quaint old town of Korcula in the afternoon, we were treated to an hour long guided tour of the historical centre. This town was under Venetian rule for 800 years, and there are reminders of Venice everywhere, both in the architecture and the layout of the town. Day Five: The longest cruising time today saw us enjoying a leisurely morning on the boat, including a stretching session, an hour long talk on the entire history of Croatia (fascinating) and another swim stop. Although shorter, today’s ride on the island of Brac proved to be tough, as we set off in the heat of the afternoon and it was a steep climb to 400m. However, it was a beautiful island, and it was interesting to see the quarries where the famous white limestone is mined. (Rumour has it that the White House in Washington is built of this limestone . . .) Tonight’s dinner was a special one chosen and lovingly prepared by the chef: Croatian specialties, including 4 month salted anchovies, local Brac cheese and beef marinated for 16 hours. Day Six: Today was spent on the mainland of Croatia. 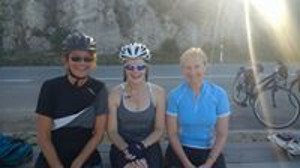 Starting at the town of Omis, we cycled along the Cetina river valley and then up yet another long steep hill. After just 12 miles, we stopped and our bikes were loaded onto the van, because we were doing a 10km rafting trip along the river, including a long section on the rapids. This proved to be a fun expedition, with beautiful scenery and thrills to boot. In the afternoon we cruised to the beautiful world heritage site of Split. Here we enjoyed another tour, taking in the old town adjoining the famous palace built by the Roman emperor Diocletian in 305 AD. Many sections of the old Roman walls, floors and aqueducts are still standing, and it was fascinating to see that in the mediaeval ages, houses and shops were built so that their back walls are in fact the old Roman walls. The local bank had a massive Roman pillar right in the middle of it, as well as an aqueduct running along the floor. Day Seven: The final cycling day saw us doing a short tour on the island of Solta (although compulsory mountain climbing was again included! ), where we enjoyed a visit to a local bee-keeper, the island being famous for its lavender and rosemary honey. After this, we had our final cruise (including the daily swim stop) to Trogir, where we had started. Another tour of this historic town was a delight, and then we had our final dinner together, with much merriment and many drinks, plus fond farewells and exchanges of email addresses. I booked this tour through Freedom Treks, who were extremely helpful to me. These boat and bike tours are run by the German firm Inselhüpfen (“Island Hopping”): http://www.inselhuepfen.com. 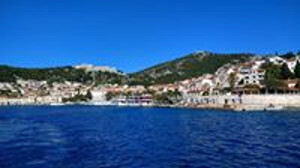 They do boat and bike tours in other parts of Croatia and also in Greece and the Spanish islands. The tour was all-inclusive; all I had to pay for was the transfer from Split airport (local bus only £1), two lunches and one dinner. I thought the tour was great value for money and would recommend it.